I recently re-posted a piece from a few years ago – “How To Be Old.” I can see the allure of growing old gracefully a la Judy Collins, but I also see the delight of defying old age like Buffy Sainte-Marie. And this week I saw another approach to old age. I would call it Gentility. My husband and I were at A.J.’s, our favorite dive in Goshen, Connecticut. (Yes, there is a Land O’ Goshen here in the northwest corner). A.J.’s is a cellar. Literally. Upstairs is the kitchen and take out pizza window. You go downstairs to the bar and what you might kindly call a dining room. They did a remodel last year – which basically means they fixed some of the holes in the ceiling. To put it mildly, A.J.’s clientele is diverse. Lots of bikers and old guys sitting at the bar mingle happily with the families with toddlers. There’s a barrel full of peanuts and the patrons are encouraged to toss the shells on the floor. So walking around is really crunchy. If you have a wobbly table, the waitress hands you a stack of cardboard coasters. Use as many as you want. Sunday night is taco night – $2.00 each. We go there just about every Sunday. We split a big house salad, and have one taco each. Hubby has a beer or two, but I stick with water. We are usually out the door for under $20.00, tip included. And this Sunday, I was eating my beef taco in the soft shell, when an ancient couple came haltingly down the rickety steps. One foot down, the next foot to meet it. Stop. One foot down. Next foot down. Stop. Repeat. They finally came into view. Both the old lady and the old man had white hair, bent shoulders, and high-waisted pants. The old guy was distinctly more debilitated than the wife. He could hardly walk, but his gallantry amazed me. For when they shuffled over to the table, the wife stood, holding the table edge for support (I prayed the rickety thing would hold her), and her husband, with great effort, pulled out her chair, and extending his shaky hand, offered her a seat. Gentility in a biker bar. That’s a good way to be old. I hope my love lasts that long…pulling out that chair was a gesture that cost nothing but bought him forever love. I had the feeling he had been doing that for sixty years. You know that I’ll drive 45 minutes to have lunch at AJ’s with your hubby, the place is that appealing. Those two geezers just make it even more so. Would have liked to meet them. And they were quite dressed up for AJ’s. What a wonderful thing to see, and how touching. 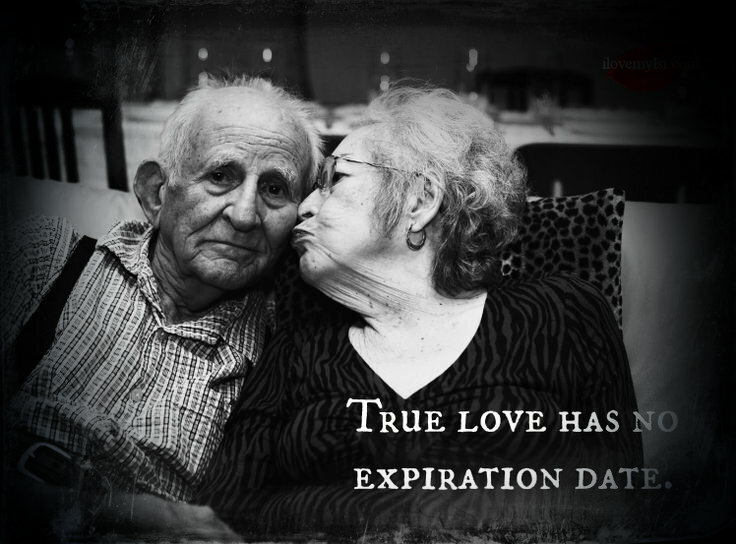 There is no age limit to True Love is there. He was so classy. And she was so regal! I wish I’d been there, I would have bought them a drink. Be still my heart. I turn into a puddle when I see this sort of thing. Or how about the couple who need canes to walk but get up on the dance floor or the couple you see out walking, holding hands. Oh, you have just brought back a tender memory. In the last years of my father’s life, he was not well. But we were at my nephew’s wedding, and during the reception, my father took my mother’s hand and led her to the dance floor. I knew it was probably their last dance together after more than 60 years of marriage (and it was), and I cried throughout. I remember my father sitting beside my mother near the end. He held her hand in his, and although she couldn’t acknowledge his presence, I remember thinking. “This is what it all means,” and knowing I would never forget the magnitude of that simple gesture when words were no longer important. I saw a picture the other day floating around of a couple who had been married 80 years. How is that possible, then I thought it had to be the small things. I loved this story, wonderfully touching. My parents had a loving marriage for 64 years. They were a wonderful example to me. And I think the foundation was a deep respect for each other. I’m with Cut The Crap. I would have had tears running down my face. There is nothing like witnessing this kind of love and respect between a couple. It turned a simple and pleasant evening into something truly memorable. Such a nice image! Your old couple in the biker bar knows the trick to enjoying life. You could just see how much their dignity meant to them. That’s going to be my and my husband in 25 years. Enduring love is something to be savored, isn’t it? We don’t see that often enough but it doesn’t mean we can’t all strive to make it happen. Ageing doesn’t mean we have to act old when every day brings more life to live! “Gentility” ~ love that! Thanks! Particularly touching for me today. I take a walk each day in the ravine valley by my home. There is an elderly man I sometimes walk with who just lost his wife. I don’t really know the man. We just happen to be taking our walk at the same time. I never met his wife. He tells me how the two of them loved this particular trail. They walked it regularly before she became ill. Sometimes he is a bit ahead of me, and although he is alone, I see her. Gentility describes the essence of this quality so well. Thanks.